Lacks the option to convert into a full-sized bed for kids. Oeuf proudly claims that they consciously avoid the more financially lucrative option of manufacturing their products in China, and continue to use Europe as their manufacturing hub. Why? To ensure that they continue to represent the high quality and environment friendly image they have carved out for themselves in recent years. This attitude shows in their line of products as well, with Oeuf’s brand name now considered to be synonymous with high quality, green products of simple, elegant design. Their latest offering is the Oeuf Rhea Crib, a beautiful baby crib for parents looking for a high quality, safe and non-toxic bed for their little ones to sleep. The Rhea crib is the third baby-crib design made by Oeuf, and is an update to their older model the Oeuf Robin Crib, which is not sold any more. 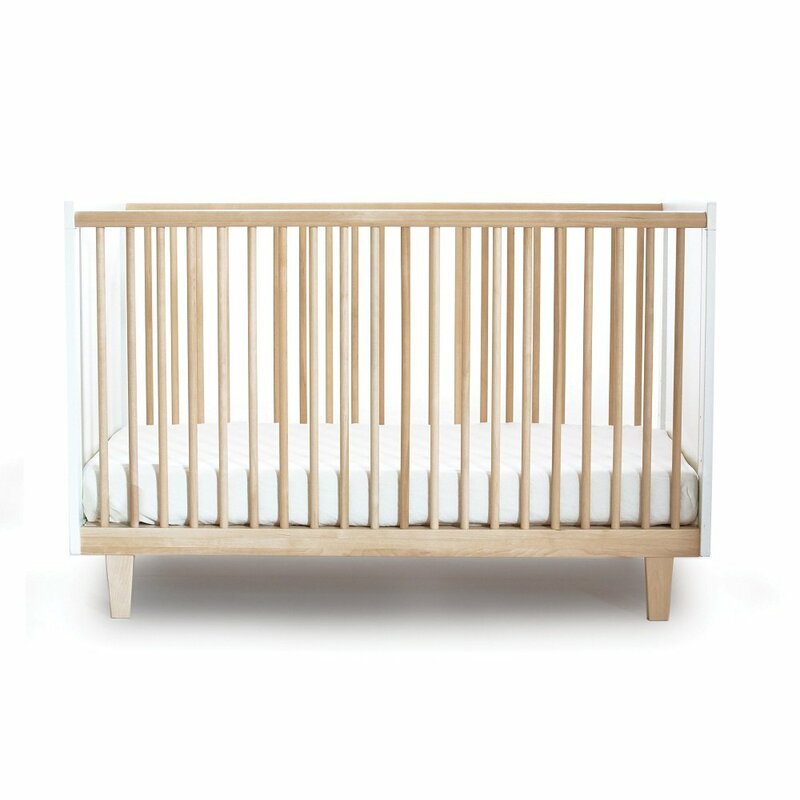 The design of the Rhea crib looks very elegant and sophisticated just like all the other Oeuf products. Currently priced at a mid-level price range of $670.00 on Amazon.com, the Oeuf Rhea is available in two different finishes – Walnut and light Birch. You can also upgrade your Rhea Crib into a toddler bed by using an additional conversion kit, which is sold separately at $158.00. 1. Made of Sustainably-Sourced Wood – The Oeuf Rhea Crib is made of solid birch and Baltic birch plywood, which is more sturdy, long-lasting and secure than a MDF (Medium Density Fireboard) crib. It is made in Latvia (not China like most other products), a Baltic nation with access to very high quality local wood. 2. Elegant Design – Like all other Oeuf products, the Rhea Crib is also built to blend perfectly into any modern nursery with its sleek design and premium construction quality. The warm wood tones also combine perfectly with the matte white head and foot boards, to fit in with virtually any décor. 3. Adjustable Mattress Positions – There are 3 different, easily adjustable mattress positions available which you can adjust to a setting suited to your baby’s height/size. The Rhea crib, anyway, has a low height and so, it makes for a convenient access to your baby while lifting/placing him down in the crib. 4. Non-toxic Finish – The body of the crib is made of sustainably sourced wood and is coated with a water-based, non-toxic paint, to ensure a highly safe sleeping environment for your baby. The entire coating is VOC-free (VOC are volatile organic compounds, which generally remain in gaseous state and produce an intoxicating smell harmful for your baby) making it a healthy pick for your baby as well as your home. 5. Scratch-Free Wood – The Birch plywood used in the body of the Rhea Crib is completely scratch and resistance free, rendering a smooth touch across the surface. So, if your baby has reached his/her teething stage, you need not worry about him/her biting off the wood and in the process, hurting him/her self. A lot of cribs which are made of MDF and wood combination, get damaged easily but the Rhea Crib stood our test of making any indentation on its surface (using a coin, rattles and teething toys). 6. Additional Accessories – The Oeuf Rhea Baby Crib can be upgraded to a toddler bed by using a toddler conversion kit, which is available as a separate purchase (at $158.00). This ensures that you derive the maximum usage out of the crib, as your kid grows with age. There is also a matching Changing Station/Table available at an extra cost, where you can change your baby’s diaper and clothes in general conveniently. 7. Additional Features – The Rhea crib is built in compliance with modern safety standards (namely US, Australian, Canadian and European Safety Standards) and is highly eco-friendly. Designed with a small footprint, it takes up very little space but at 85 pounds is heavy enough for expecting mothers and women in general. Also, it comes with a 5 year manufacturer’s warranty for the wooden frame and parts, and 1 year for the finish and hardware. 8. Ease of Use & Maintenance – The crib is quite easy to assemble and stands at a comfortable height, to allow you easy access to the baby. It is slightly on the heavier side at 85 pounds, and so mothers should seek some assistance while moving it around the house. It can be cleaned by using a lightly dampened cloth to wipe away any dirt or stain from its body. It is advisable to cover the mattress with a machine washable waterproof pad, to avoid any unnecessary mess on the mattress itself. The Oeuf Rhea Crib stands out in comparison with other similarly priced baby cribs of several brands, thus making it an almost ideal choice for a mid-level Baby Crib. We are listing below a few shortcomings of various products when compared with the Rhea crib. b) Franklin and Ben Mason 4-in-1 Crib – Larger dimensions make for inconvenient access and storage. c) Oeuf Elephant Crib – Made of MDF, not wood. Expensive for a crib made of MDF and not real wood. 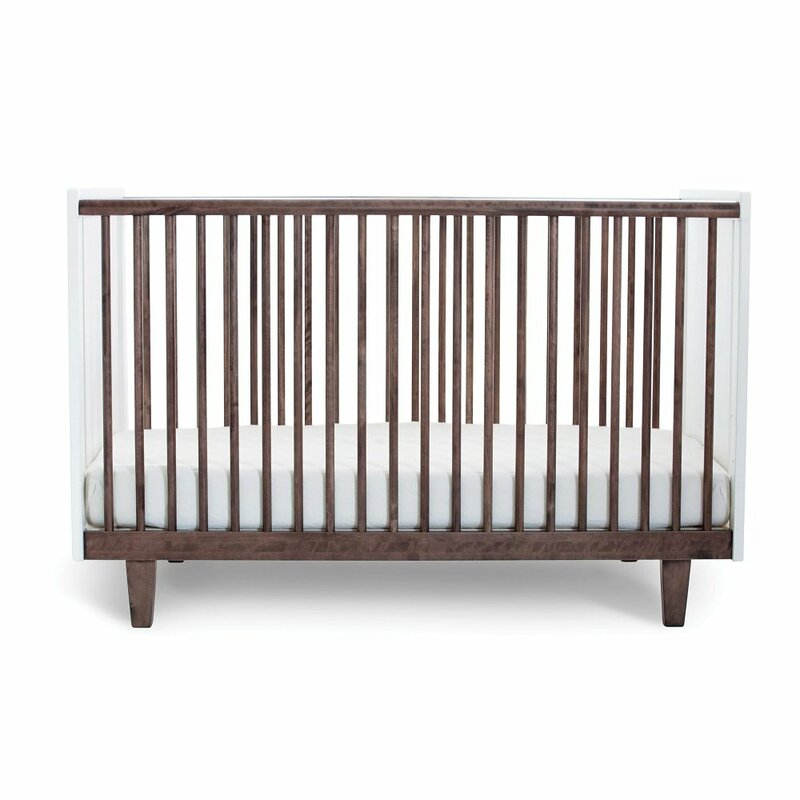 The Oeuf Rhea Crib is a high quality product from the Oeuf brand, which is being offered at a mid-level price. If you are looking for a baby crib and are sure that you are going to use it for next 5-6 years, the Rhea crib is ideally suited for you. With its durability, high quality construction and safety features, the Rhea crib is certainly worth the price. It will continue to stay useful for you as a toddler bed, even after your baby as grown up.